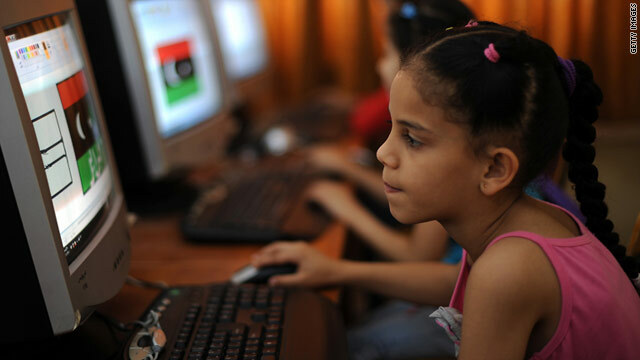 A Libyan girl uses a computer in June at a school organized by volunteers to keep children occupied far from the fighting. Message on Libya's Internet service provider celebrates end of the "rule of the tyrant"
"Welcome to all our brothers & sisters from inside Tripoli on Twitter... Internet returns to them first time in a long time! #Feb17 #Libya." The message on Twitter came from the National Front for the Salvation of Libya, an opposition group that has long spoken out against the regime of Moammar Gadhafi. Internet service was, indeed, returning Monday to Tripoli and other parts of Libya. In a digital age in which the free flow of online information is credited with everything from helping topple dictators to abetting riots, that could be taken as a signal of emerging freedom almost as strong as the rebel forces advancing on Gadhafi's last stronghold. Google's "transparency report," a tool that documents how the company's products are being used in countries where Internet freedom is limited, shows a dramatic spike in Libyan usage at about 11:30 p.m. GMT on Sunday. "Congratulations, Libya, on emancipation from the rule of the tyrant," it said, according to a translation by Renesys, a New Hampshire-based company that monitors Web usage. Fewer than 6% of Libyans are on the Internet, according to the ITU, an agency of the United Nations that focuses on the Internet and communications. Some observers believe this has slowed the pace of revolution in the country. By comparison, about one-quarter of people in Egypt, where protests toppled president Hosni Mubarak in February, have Web access. On Monday, rebel forces were battling with the remainder of Gadhafi loyalists in the city of Tripoli after already securing much of the north African nation he had ruled with an iron fist for 42 years. Libya has seen rolling Internet blackouts and near-complete outages since a democratic uprising began in February. Governments have been known to use Internet blackouts as a weapon in recent uprisings. In Egypt, where Mubarak was ousted after a 30-year reign, the Internet was shut down completely for five days. Web-monitoring firm Renesys described a chaotic and confusing series of online events in Libya from late Sunday to early Monday. "We're still piecing together the data that can confirm or deny much of what's been reported overnight, but one thing is clear: something very strange was going on with Tripoli residents' Internet access," company co-founder James Cowie wrote on the Renesys blog. Then, at about 4 a.m. local time, the Internet was out again, going on and off line sporadically until appearing to be up for good late Sunday night.